This post is part of a series called Street Photography. “It is the photographer, not the camera, that is the instrument.” Late, great Magnum photographer Eve Arnold once famously said that, and I’ve yet to meet a photographer who disagrees. But I would add that it’s only true when all is in working order to begin with, when the photographer is able to get out of the camera’s way in order to be the instrument. That particular camera allowed him to see in the special way that photographers see: simultaneously as participant and observer. The camera that is right for you will also offer this beautifully balanced experience—so long as you are open to it. Despite the technological breakthrough of the 35mm camera, plenty of street photographers thereafter felt more at home with other equipment. In fact, practically every type of camera has been used successfully on the street by some photographer, and that’s largely because they understood their equipment’s features and so-called “limitations” and they knew how to use them to their advantage. The point is, despite there being trends in popular cameras to use on the street, there really is no camera that you couldn’t find a way to use successfully. Look at the pictures a camera makes. Analyze the color palette; does it impart the look and tone you desire? Think about the shape of the image; do your compositions fit best in a square, a rectangle, a panorama? Scrutinize the resolution a camera produces; will its images look good at the dimension you want? Observe the look of film-based versus digital images and consider the post-production latitude offered by digital cameras versus film cameras; what technology allows your images to shine aesthetically? These are just some of the many ways in which you can analyze a camera’s output and decide what you prefer or need in a camera. If you need to create photographs quickly for practical or instructive purposes or you enjoy the marvels that can be achieved sitting at a computer, perhaps a digital camera would be best for you. If you like the mystery of not knowing how an image looks until later, you enjoy the tactile nature of loading, processing, or printing film, or you appreciate how film slows down your process, then perhaps a film camera would be best for you. Pitting film against digital is just one extreme way to get you thinking about the processes cameras can entail; every make and model has its own specific process that’s necessary to go through to produce a picture. Make sure it’s one you enjoy and gives the results you desire. Photographing with a camera phone tends to signal to the public that you are photographing surreptitiously, sneaking around and trying to catch them unaware. It can make people suspicious of your motives. Photographing with a DSLR can draw the public’s attention to you. It’s loud and big so they notice it—and you—more easily. It tends to suggest you are a professional. Both of these cameras are perfectly fine choices on the street and offer some great advantages; in fact, some of these reactions can work in your favor. But it’s important to (1) be aware of how your camera affects people and (2) be able to manage that reaction when people confront you about it—and they will. A camera is like a human being: none is perfect. Each and every one has its upsides and downsides. Chances are even your dream camera will involve making some concessions on your part, whether in its features, process, price, etc. Make a list of the pros and cons of a camera. Decipher what you need from what you want, and then decide which camera comes closest to fulfilling both. Don’t keep searching until no end for some figment of your imagination. Get as close as you can to what you desire and then start experiencing cameras. Street photographer Louis Mendes with his camera of choice, a Speed Graphic, New York City, May 2013. Photograph by Amy Touchette. Don’t choose a camera based on what everyone else is using or what’s in style now in the galleries or newspapers. Choose a camera for you. Be honest with yourself. Street photography is usually not a commercial gig, so there's no reason not to shoot for the moon. Enjoy your individuality—for the sake of everyone else—by doing right by yourself. New York City street photographer Louis Mendes, who prefers a Speed Graphic that uses bulbs no longer manufactured (Mendes bought out the supplier’s stock years ago), is a perfect example of someone who uses "out of style" equipment with great success. Don’t stand still. There’s plenty to gain from rumination and inaction when it’s really called for, but if you are confused and restless, doubtful and insecure, etc., the only antidote to that is to act. Don’t be uptight about the outcome; just try a variety of cameras and see what feels most natural. Hold on loosely by enjoying the transience of experimentation. Chances are something wonderful will unveil itself. And at the very least, you will be further along in your search today than you were yesterday. There are plenty of things that prevent us from using the camera we truly desire: money is an immediate obstacle that comes to mind. Don’t let petty things like that get in your way. Use your hand-me-down camera or buy a used model you can afford. Get on board with its features, warts and all. Embrace its idiosyncratic ways: its light leaks, even. There’s a lot to be said for doing with what you have. Because in the end, it’s not about the camera; it’s about you giving into the camera—so that, like Arnold said, you can be the instrument instead. Be rational and thoughtful in deciphering one camera from the next, but be accepting of so-called limitations, too. Let the camera’s features and details provide you with guidelines on how to use it. Then break those rules if the impulse strikes you, and take in the results with pleasure. The more open you are to novel experiences, the more quickly you will find the camera that allows your unique vision of the street to be at the fore. Amy Touchette is a photographer based in New York City. Trained at the International Center of Photography, her first monograph, "Shoot the Arrow: A Portrait of The World Famous *BOB*," was published by Un-Gyve Press (Boston) in 2013. 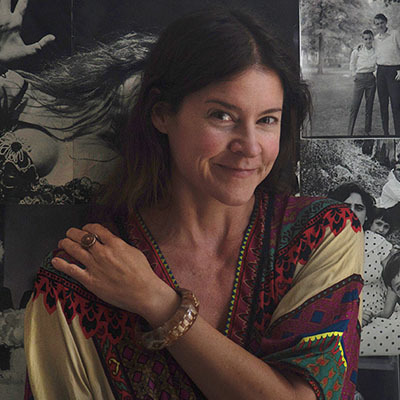 Her photographs have been published in The New York Times and Esquire magazine, and have exhibited nationally and internationally, including Moscow MoMA (Russia) and ClampArt, the gallery that represents her in New York City. She’s given artist lectures at School of Visual Arts, the School of the International Center of Photography, and elsewhere, and writes regularly about photography for a variety of publications, including PDN, Rangefinder, and Emerging Photographer magazine. She uses Instagram (@amy_touchette) as a sketch pad for her film-based street work, posting daily phone candids of strangers in New York.